Doron Matalon and Saly Greige look like two people with a lot in common, but they got a swift reprimand about their budding friendship when the former posted a selfie on social media last week. The two women happen to be Miss Israel and Miss Lebanon, respectively, and the online universe had a collective panic attack at the mere suggestion that they dare not hate one another. And, unfortunately, Greige folded under pressure and withdrew her friendship bracelet. 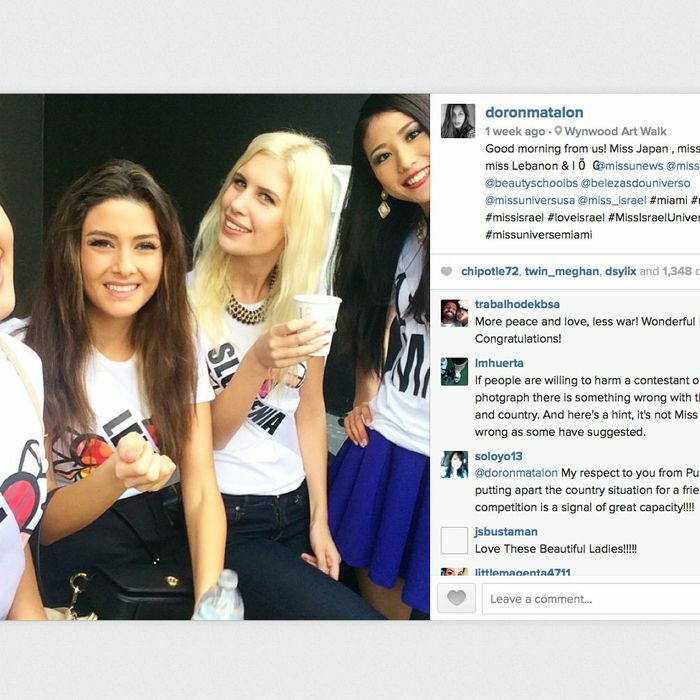 In a series of social-media posts, Greige said that she was busy taking a picture with two gals from non-offensive countries when Miss Israel just jumped right in there and snapped a selfie with them. Even the Miss Universe organization, under whose auspices the women are spending three weeks together before the January 25 contest, weighed in Monday. “It is unfortunate to know a photo of four smiling women from different parts of the world, working together at an event, could be misconstrued as anything other than what it is, a celebration of universal friendship, which the Miss Universe pageant is all about,” it said in a statement Monday. To all my supporters and Lebanese citizens, I would like to thank you indeed for your continuous support of Miss Lebanon at the Miss Universe contest… The truth behind the photo, since the first day of my arrival to participate to Miss universe,I was very cautious to avoid being in any photo or communication with Miss isreal, who tried several times to take a photo with me. I was having a photo with Miss Japan, Miss Slovenia, suddenly Miss Israel jumped in and took a selfie, and uploaded it on her social media. This is what happened and I hope to have your full support in the Miss Universe contest.